Astonishing? Promoters Leak New Dream Theater Album Title? 'The Astonishing' emblazoned over European live adverts! Dream Theater announced that their latest album would be performed in its entirety this morning in a press release announcing European tour dates. No other information about the new album has been forthcoming as yet, but Prog is aware that the band are beginning to filter information out to fans after they began teasing the release with changes to their website last week. This morning’s press release simply stated that “the winter run will see the prog-titans delivering a one-off kind of set in which they will be debuting their forthcoming album live in its entirety”, and announcing the run of dates in London, Amsterdam, Oslo, Stockholm, Paris and Milan. 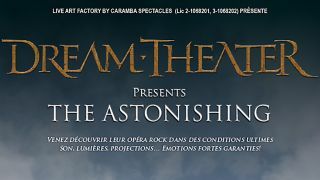 However as the dates were announced, images appeared from the France venue announcing a performance of The Astonishing. This was seemingly also backed up with a website for the Dutch venue which also referenced ‘The Astonishing Live’.